Multi-sector partnerships play an increasingly significant role in the movement to improve heath, equity, and economic prosperity. These partnerships recognize that many of our most pressing challenges defy sector boundaries, and cannot be effectively addressed by any one institution alone. Progress Along the Pathway to Health System Transformation: A Pulse Check on Multi-Sector Partnerships is the only survey of its kind to ask leaders across the U.S. what their partnerships do, how they finance their work, and how their groups have been developing over time. The 2016 Pulse Check report provides a snapshot of 237 multi-sector partnerships throughout the country as well as rich detail around what contributes to—or gets in the way of—moving their important work forward. The survey revealed two sets of findings that are distinct, but closely related. These include characteristics of the partnerships and their efforts, such as composition, portfolio priorities, and financing; as well as developmental phases and the distinctive patterns of momentum builders and pitfalls that groups experience as they evolve. Further, ReThink Health has found that partnerships often face predictable challenges and can catalyze momentum in particularly powerful ways. The Pulse Check explored these barriers and drivers with a view toward understanding how partnerships may evolve along their journey. Pulse Check findings indicate that certain partnership characteristics do indeed show progressive differences across developmental phases (see graphic below). 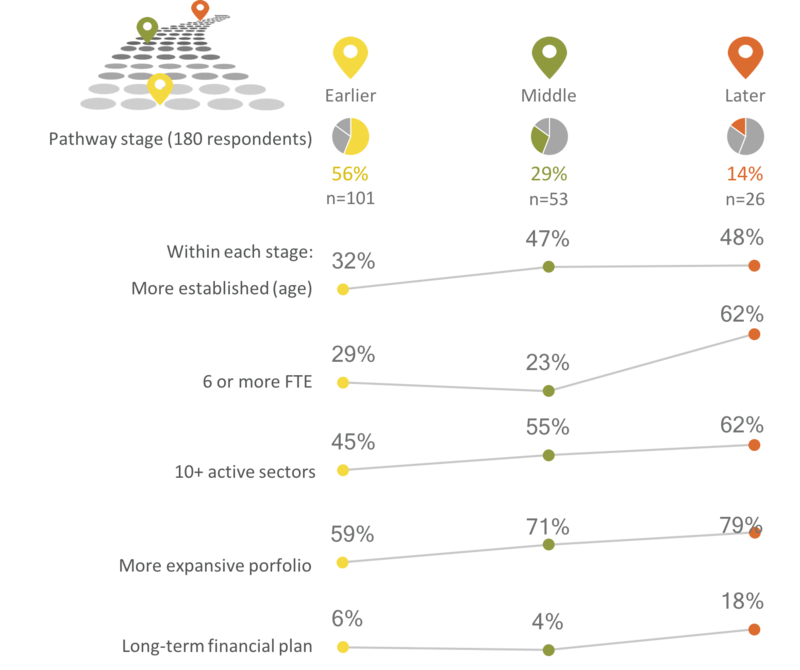 For instance, when compared to respondents in the Earlier and Middle phases, those in the Later phase tend to have partnerships that are more established, with larger staffs, a larger number active sectors, more expansive action portfolios, and longer-term financial plans. The 2016 Pulse Check survey reveals distinct developmental phases that multi-sector partnerships go through on their way to system transformation. For partnerships that want to identify which phase they are in, ReThink Health will be developing tools that people can use themselves. Sign up here to be notified when the tools become available.